The arrival of Disney's "Lady And The Tramp" in the mid-50s was not one of those traditional cartoon introductions that the studio had been giving moviegoers for almost 20 years. Here was something far beyond anything foreseen by avid audiences, a movie that stayed in its narrative limits, but leaped beyond the technical boundaries. Yes, I am referring to that elusive but effective format known as 70mm, in which the dimensions on a picture scale were stretched beyond the conventional restrictions to take advantage of larger backgrounds and visually complex material. You will recall that most of the big Hollywood epics at that time--like "Cleopatra" and "Ben Hur"--relied on this technique because their massive stories and images could not be scaled down to the typical 35mm dimensions. But it is the animated movies that were destined to be seen in widescreen, and "Lady And The Tramp" was the first to arrive at that conclusion. Alas, Disney only returned to the approach of widescreen cartoons two times later, first with the 1959 masterpiece "Sleeping Beauty," and then again 25 years later with the mysterious but beautiful "The Black Cauldron." In fact, only one of the new upcoming Disney features--an epic titled "Atlantis"--is following in their footsteps. It is understandable that Disney would want to save this ascension for large, epic-scale projects such as those, but that still doesn't help explain why more of the Disney classics were not done in the same way. The conclusion to draw is a simple one; either the dimensions are too challenging for animators who are forced to fill an entire letterbox-sized screen, or the studio is afraid of financial failure (both "Sleeping Beauty" and "The Black Cauldron," after all, had massive budgets but failed to earn the money back at the box office). 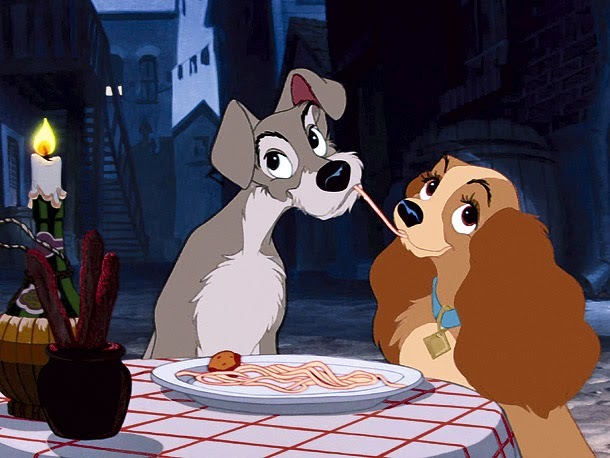 "Lady And The Tramp" did not fail--it survived an onslaught of major motion pictures that year, and was one of the most successful Disney cartoons that had been created up to that point. Though most would like to think that credit is owed to the "Technirama" format, the massive financial status probably had to do more with the animated formula. By this, I'm referring to Disney's clever notion that, if put into animated context, animals such as dogs can talk just like the average humans (and with sometimes better intelligence). There is something, after all, about talking animals that attract large audiences; the earlier animated features--"Dumbo" and "Bambi," for example--had already established animals as the most fascinating and colorful cartoon characters, and this movie was the next step, so to speak. Ahh, but now I seem to be forgetting to comment on the story's narrative brilliance. Visual images on a 70mm screen are bound to be stunning, but it takes a fun and good-natured story to back them up; here, we have a premise that joins two opposites in a sweet love story as adventurous as it is fearsome and daring. The first is an up-class Cocker Spaniel named Lady, who is given to a couple as a Christmas present, and grows there as the center of their attention, sleeping in their bed every night, and getting doughnuts and coffee for breakfast every morning after retrieving the paper. But then one day Lady's friends, Jock and Trusty, notice that their neighbor is down in the mouth. Her reason? Oh, the owners are not paying much attention to her lately (they remark to her as "that dog," and strike her when she wants to be playful). Both of her friends take it upon themselves to explain to Lady the nature of their situation, in which Darling (the given name of the female owner) is expecting a baby. Though the two friends describe babies as "soft and sweet," the arrival of a streetwise pooch called the "Tramp" interferes with their claims. After the plot has established Lady's love for the infant (and the assuring love that the parents have for Lady), the couple leaves town and puts the child in care of Aunt Sarah, a rude and judgmental woman who has two scene-stealing Siamese cats along for the trip. In a series of sudden developments, which seem pointless to describe individually, Lady ends up on the streets alone and scared, with the Tramp immediately coming to her rescue. The love story picks up speed afterwards, but not before Lady is suddenly picked up by dog catchers, and briefly taken to the pound. And it is in these scenes that the animators rip our hearts to shreds; witnessing the sadness of the other canines as they prepare for impounding is one of the great moments of sorrow in the Disney vault. All of this looks so attractive in the 70mm dimensions that the later canine films, like "101 Dalmatians" and "Oliver & Company," could not begin to compete; what a shame it is that two of the video releases in the past 15 years have not relied on that technical specification. Thankfully, by releasing the film on DVD in its preserved format, Disney is trying to keep the true vision of their 15th animated feature alive; seeing it formatted for television screens takes away much of the visual impact.